The Stevens Family Horse Farm began over a dozen years ago with one horse, a blind purebred Arabian mare named Erikatez. She was given to us to prevent her from going to a slaughterhouse or other numerous fates that she didn't deserve. You might ask yourself what use a blind mare could be, but to do so would be to underestimate the intellect, and trust a horse can have. She would, could and did nearly everything a sighted horse could do. She developed an intense loyalty and love for my wife Tracey, to the point that the relationship between the two was so strong, it was hard to tell where one ended and the other began. They talked to each other daily, nickers and whinnies and whispers that only they seemed to comprehend. They shared pumpkinbread at breakfast (the family joke was that Erika would eat anything that didn't eat her first), she once chased Tracey across the field to get a bite of her bread! That horse trained us, and taught us the amazing relationship and communication that can develope between human and horse. 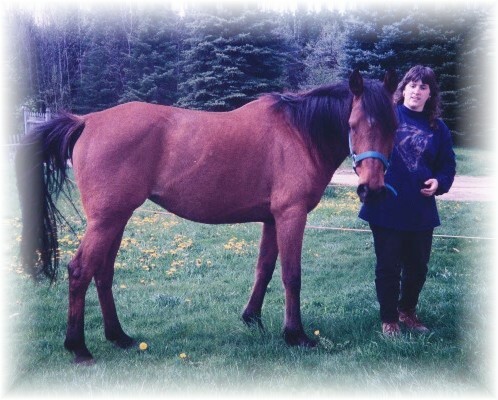 After several additions to the family, (both children and horses), and many years of friendship, our dear Erika left us the night of Dec 5th, 2000. The Stevens Family Horse Farm, and this website is dedicated to her memory. Our greatest equine teacher and friend.